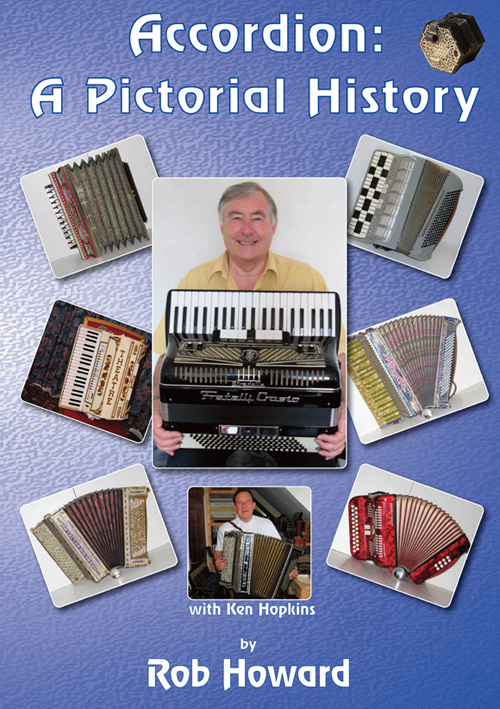 Accordion: A Pictorial History by Rob Howard - Book Review in English by Peter Ayers (MD Norvic Concordia). ‘Accordion: A Pictorial History’, recently published, is a sequel to Rob’s 2011 publication, ‘Vintage Accordions’, “an illustrated look at how the accordion has evolved since the early 19th Century”. When I bought the book, it seemed to be thicker than the earlier book and, indeed, it is, but when I counted up the number of pages (there are no page numbers), I found that they both are 60 pages long. The difference is that the later book is printed on thicker paper. Both books are hardback and stitch bound and printed on high quality paper, with numerous photographs, mostly in colour. Even the photographs of 19th Century instruments and portraits are in colour. I found ‘Vintage Accordions’ added much to my knowledge of the history of the instrument and, although ‘Accordion: A Pictorial History’ covers the same chronological structure, it certainly adds more missing parts to the instrument’s history without repetition. It is in no way a revision of the earlier book, but, as described, is a sequel, adding to its wealth of knowledge. There has been a great amount of research involved in digging deeper into the recorded history of the instrument and Rob gives us a list of those who have helped him, as well as those who have contributed pictures. Although I was aware that French makers, such as Constant Busson, were prominent designers and makers of the accordion from the 1830s, the book gives us a detailed account of how prolific these makers were until the disastrous Franco–Prussian War of 1870/71 ended their dominance and allowed the Italians to become, as they are today, the world’s leading accordion manufacturers. As with ‘Vintage Accordions’ the latest book covers the 19th Century in two sections (The Early Years and The Later Years) and then has a section on each decade of the 20th Century, with copious photographs of instruments from each decade, some of which are unusual, because they contained features that never became part of the standard design. There are short articles on outstanding players and full length articles on typical developments from each decade – Concertinas (early years), Frosini, Guido and Pietro Deiro (early 20Th Century), Accordion Bands (1930s), The Uniform Keyboard Revisited (1940s), Italy, Hohner and East Germany (post–war era) and The Syd Lewis Broadcasting Accordion Band (1950s). The final section deals with developments in recent times and there are three appendices – The World’s Largest Playable Accordions, A World of Accordions Museum, run by Helmi Harrington in Superior, Wisconsin, USA and a book and CD of Early Accordions and Their Recorded Sound by Gorka Hermosa of the Santander Conservatory, Spain. I was very interested to see a photograph of a Chuisarolli diatonic instrument of 1901, because my father had a 5 voice 120 bass Chuisarolli piano accordion of the 1940s, which to me, as a youngster learning to play on a 3 voice 120 bass Piano Soprani, was a monster instrument Although I remember his instrument well I have never seen another Chuisarolli accordion until now. If you enjoyed ‘Vintage Accordions’, or are fascinated by the wide variety of accordions and other free reed instruments that have been made, since manufacturing began in the 1830s, then you will welcome this excellent book, written by a tireless enthusiast.